Which patch do I need? 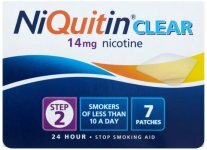 If you smoke more than 20 cigarettes per day, use Step 1 Nicotinell TTS 30 (21mg/24hour) patches. 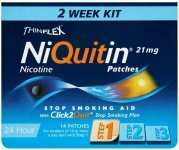 If you smoke less than 20 cigarettes per day or you have completed Step 1, use Nicotinell TTS 20 (14mg/24 hour) patches. 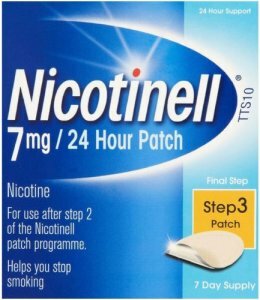 If you have completed Step 2, use Step 3 Nicotinell TTS 10 (7mg/24 hour) patches. Do not start the patch programme at Step 3. 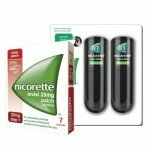 Nicotinell patches can help you stop smoking. When you apply the patch, nicotine passes through your skin and into the body, replacing the nicotine you would normally get from smoking. The patches come in three sizes. As your body adjusts to not smoking you should gradually reduce the size of the patch over a period of up to 12 weeks until you no longer need to use them. 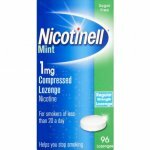 Nicotinell patches can help you stop smoking. When you apply the patch, nicotine passes through your skin and into the body, replacing the nicotine you would normally get from smoking. The patches come in three sizes. As your body adjusts to not smoking you should gradually reduce the size of the patch over a period of up to 12 weeks until you no longer need to use them. Each patch contains 21mg of nicotine. Consult your doctor or pharmacist if you have an underlying medical condition, are taking any other medication or complementary therapy, or if symptoms persist. Seek advice before using if you are breast feeding, pregnant, planning to become pregnant, or suffer from allergies. Keep all medicines out of the reach of children. Relapses can and do occur, so don't despair. Many ex smokers usually try several times before being successful. Think of your relapse as a temporary set back, rather than a failure. Use the experience and learn from it, so that next time you won't be tempted again. Remember, if your determined to quit you can and will succeed, so try again as soon as you're ready. Think of yourself as a non smoker, not a deprived ex-smoker! Initially you may find that you would still prefer a cigarette to Nicotinell Patches or lozenges. However, once you stop smoking, you'll find that your sense of smell and taste improve so you'll start to find that you will start enjoying food more. Don't risk losing it all again with just one cigarette! For adults and adolescents over 12 years of age. Read the instructions that are in the pack. Apply one patch every 24 hours to a clean, dry hairless area of skin. After 24 hours, use a new patch. You must not smoke whilst using these patches. The patches are designed to be used continuously for 3 months but not beyond. If you still need help controlling your cravings at the end of the 12 week treatment period speak to a doctor, nurse or pharmacist for further advice. Do not use if you are a non-smoker or occasional smoker, you have a skin disease, or you are allergic to any of the components of the patch. Consult your doctor, nurse or pharmacist before starting to use these patches if you are under 12 years of age, in hospital with a serious heart disease, pregnant or breast feeding or under a doctors care or taking prescribed medication. See leaflet in the pack for full information.